With the cruel introduction of Modi's demonetisation plan, I thought I was nearly demonised as a I scrambled to exchange some rupees lying around for the Giant Duathlon Race 2 on Friday 18th. But nothing was to hit me like two separate events this past week. One was the biggest full moon I had seen in my entire life. The other was a root canal surgery on my molar the day of the full moon, when the dentist went beserk with his drill and file and howled incessantly as he smashed bits of my teeth to put a manhole and a manhole cover in my mouth. Duathlon Race # 2 had no particular strategy precisely because the entire time I was racing, I could feel the dentists tools gnawing away at my mouth and my head shaking from the mechanical impact. Skrutch-skrutch-skrutch. But thankfully, due some fantastic pre-race photos from Race.ME posted on Facebook, I managed to practice plenty of transitions from the comfort of my own living room chair. I hopped off, hopped on and hopped off the chair several times. Good practice. Come race day, I made a deliberation not to bring my lovely wife along. 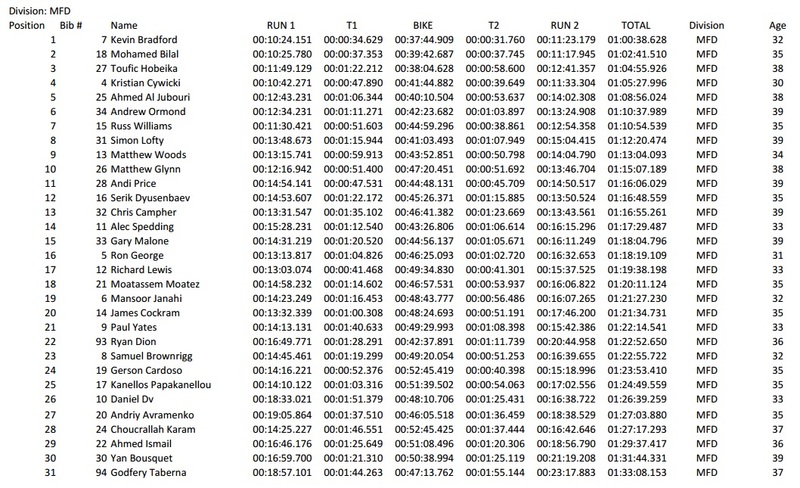 Not only did I get to the race quicker than historical trends, I also had time for a full 12 minutes of warmup routine - 10 minutes for a ride and 2 minutes for a run. Not a bad way to start eh? 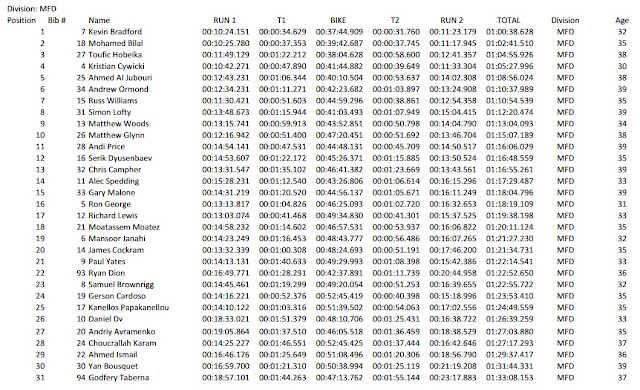 So without further delay, how did this race turn out? The little good blurb is that I smashed a PB with a 1:18:19. But the dreaded 2nd run cramp did prove to be a force to contend with. The nice thing is that I had nearly 300g of sodium diluted in my drink and had two bottles of those. So even if cramps did show up, the calves were to be spared but a tingling in the right hamstring would assume it's place instead. I have no clue whats going on with this right leg this season, but suffice to say I've been doing more stretches this year than in living memory. I can only conclude that the body is still coming to terms with the intensity this year. Data wise, I ran my most conservative first run ever. Clearly 13:13 was holding back around a good solid minute atleast and that proved to be a little unplanned disaster. My best pacing for short events is 6:20 min/mile and keeping that in mind, my potential lies in a sub-12 minute run. Again, I held back, not knowing how the stress of a root canal might dissolve into this race. The transitions were consistent with my past efforts. A minute each. The biking felt easy to me, which again means not putting in a 100% effort. This could only mean that this course is destined for another PB whenever the race visits District One cycling track again. The final run, with the cramp added in there, was also my slowest run 2 in probably a long time. The elements pieced together nicely in the end, but I find the total potential to be in a sub 1:15:00. Why a top 10 escapes me is something I've got to do some homework on. Okay, I blame it on Obama and Hillary. A couple of things that stand out. I like the cadence on all segments of the race. Critical power is a bit on the low side and that doesn't come as a surprise in the early season. The nice thing to see is the 1.3% improvement in 20 min peak power from October's BeSport TT. Unfortunately, I've found no way and time to improve this than to do more time trial races in the aero position. 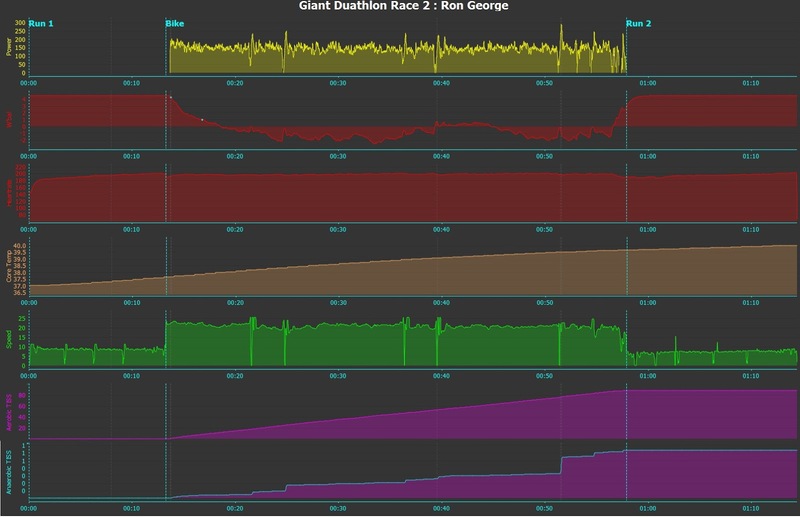 It's also amazing how a position tweak on the bike even a few millimeters translates into reduced watt demand (or increased watt demand). A couple of people asked me how I manage with such high heart rates. My body is genetically turbocharged like that and I tend to fall on the right side of the statistics. As WWF says, "Do not try this at home". Interestingly, over 12 years of cycling and running races later, this has been the same picture. The range of my heart is from a cool 55 beats at resting to 212 beats at red line max, however the 212 has come down to 207 in recent months, which maybe from the training. 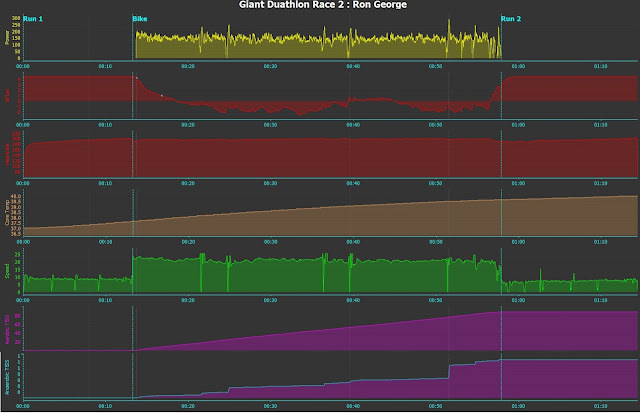 The bad news is that when I was younger, my maximums were much lower, around 203 bpm, so this can only go to show that coming back to the UAE from the States has led to nothing but decreased time to train and decreased mileages. My body continues to surprise. Leading up to this race, I was curious about how the parasympathetic portion of my automatic nervous system handles the stress of the week - work, training and medical. 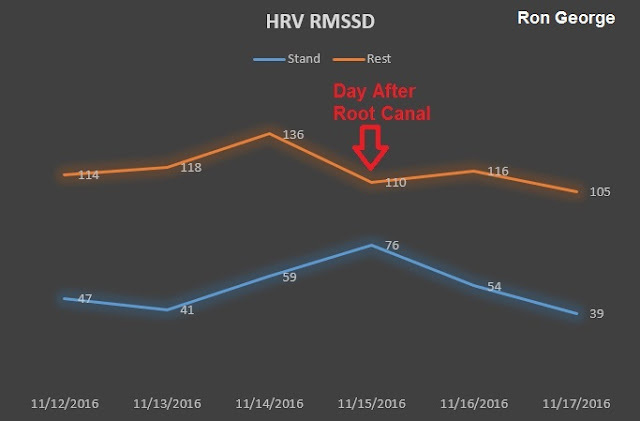 Below is an HRV RMSSD plot of the past week. In general, bigger numbers mean I'm more relaxed. Although I'm not a cardiologist, the dip in parasympathetic response coincides exactly with the day after root canal (15th of November). This meant my body was a bit more stressed than other days of the week and clearly I had to push back training and get some added rest time. Interesting how the numbers agree with "how you feel". That's all folks. The next 2 weekends are filled with racing so never a moment to fall into a lull. Fun fun! Happy training!